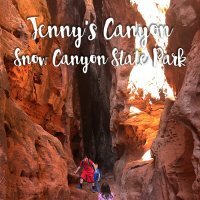 Johnson Canyon is a great hike for getting kids to spend time outside without pushing their limits. 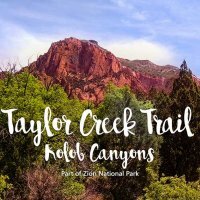 Johnson Canyon trail can be found just outside of Snow Canyon State Park. In fact, it really is just feet from the ranger station entrance. Since it isn’t technically “in” the park…BONUS! Fee-free trail! 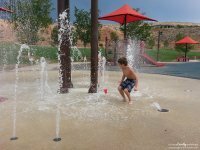 You don’t have to enter Snow Canyon State Park to enjoy this trail…it’s free! 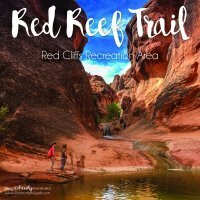 I have also heard of this trail being referred to as “Johnson Arch” because of a beautiful arch you see along the trail. However, on the books, it is technically named Johnson Canyon for the small canyon found at the end of the hike. Do be respectful of the trail rules: Stay on the trail and NO DOGS or other pets are allowed (on or off leash). TAKE NOTE: Because of the critical habitat and sensitive natural resources, Johnson Canyon trail is closed March 15 to October 31. You can hike this trail during those times but only on a ranger-guided hike. The parking is on Snow Canyon Parkway, just before the ranger station. Park and then cross at the crosswalk to the trailhead. There will be a wooden fence with a swinging gate you will need to enter through. During times the trail is closed, this gate will indicate the closure. My first thought when starting on this trail is how cool all the lava rock was that surrounds the path. Then I realized how jagged the lava rock is. Then my brain went to “oh, great…how long before one of the kids biff it and these jagged rocks end the hike before it has even started.” — but seriously, they are really pointy! Even in my running shoes I could feel the points in my feet. So…don’t wear flip flops and don’t let the kids wear sandals. Make sure you wear sturdy shoes for this adventure. 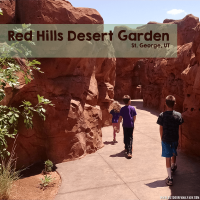 The brochure handed out at the Snow Canyon State Park ranger station indicates that this trail is 2 miles long. Another website stated it was just shy of two miles. I decided to track our adventure using the GPS on my Fitbit and it put our hike at 2.47 miles. I am sure some of that included us walking around the canyon and looking around. With some whining kids and lolly-gagging (as we call it), we completed this trail in 1 hour and 20 minutes. As with a lot of trails in Snow Canyon State Park, there is sand. Some of the paths are packed down, but there’s still loose sand. Best to prepare yourself and the kids for sand in the shoes. It’s just gonna happen. I figure if they know about it from the beginning, it’s usually easier for them to cope. 😛 Maybe it’s just my kids. As you come around the corner of some rocks, there is a fun canyon (er…gulch?) to the right. There’s a ginormous boulder in the middle. The trail looked completely level and then all of a sudden the canyon appeared. Very cool! Lots of big boulders and very rad rock formations. My kids had so much to look at on this trail. Okay, real talk. I told my kids this trail was about 3 miles long. You know, rounding up so they were pleasantly surprised by how short it was. Here we are at roughly .75 miles (thanks Fitbit GPS). This lovely child was D-O-N-E! Did you know his legs are about to fall off? No, but really. He almost died, guys. Don’t laugh. So just know, if you hit this little run-off area with a pipe and your kids have been angels, you beat me. Coming around the mountains you can see that you are entering the canyon areas. To the right is a little stream (depending on the time of year) and you may even be able to hear the endless croaks of happy frogs! Be sure you look up to see Johnson Arch! It is a gorgeous archway spanning 200 feet carved in to the hillside. We hiked in the middle of February, a few weeks after some rainstorms. We were lucky enough to have a little bit of water on the hike. Water + kids + hiking = The Best Time Ever. If there is water, there is going to be happy kids. Once in the canyon, you are surrounded by willows and cottonwood. It is so cool and pleasant. Such a nice place to stop and enjoy your adventure. My son’s favorite “I Spy” moment was on the way out. Tucked up on the canyon walls (outside the main canyon area) are pioneer names etched in to the rock. In the picture below you can see the year 1873 carved. Doesn’t it make you wonder if the kids snuck up there and then the next morning their mom caught sight of it and you can just hear her bellowing, “E. HAFEN!!! WHAT ON EARTH WERE YOU THINKING? !” No? Just me? Okay. Whatever. And our final “everyone is dying, think of something” game heading out is: Try and find your footprint from when we were walking the other direction! This trailhead also serves as the starting trail for the popular Scout Cave (west end). Take this same trail but when you come to the wash, head right (you will see a sign). Continue straight across the wash to go to Johnson Canyon/Johnson Arch.